Together, the Catholic Church and Fianna Fail held up 20th-century Irish life. Filling a crucial gap in the literature, M.P. McCabe examines their relationship at the birth of the modern Irish state. The result is a study of rhetoric giving way to pragmatism. In recent years, two institutional pillars of Irish society, the Catholic Church and Fianna Fail, have dramatically crumbled in prestige. Together they held up much of 20th-century Irish life, in (apparently) mutually-supporting ways. In contrast to this harmonious image, author M.P. 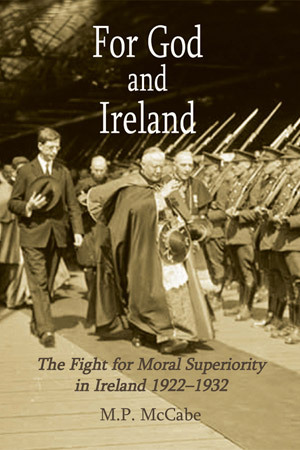 McCabe examines their often strikingly difficult relationship at the birth of the modern Irish state. For God and Ireland argues for an all-encompassing assessment of the relationship between these competing bodies. The result is a study of rhetoric giving way to pragmatism. Each side longed to achieve moral superiority over the other. Instead, both sides found that what they said and what they could do in the situations in which they found themselves were often drastically different. Unfortunately for many in Ireland, the heated words left deep wounds that never truly healed. The book fills a crucial gap in the literature, building on the vast amount of new research and perspectives which have emerged over the past 25 years. M.P. McCabe is Adjunct Professor in the Department of History, Saint Louis University.